ARCHOS FAQ - How do I configure my 3G/4G connection? You need a mobile phone contract that offers data connection and also you need to insert the SIM card in the right slot if your device has two SIM card slots. 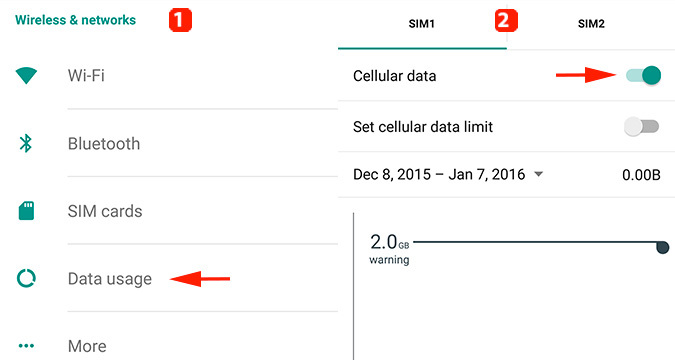 When you turn on your device, a warning message asks you to set your SIM card settings. You can follow the offered solutions one after the other until you solve the problem. According to your provider, different solutions can be possible. To know the version of your Android™ operating system, please refer to the following FAQ. Go to the All Apps section and open Settings > Data usage. Slide the switch button to ON. Go to the All Apps section and open Settings > SIM management. Make sure your provider is selected. Go to the All Apps section and open Settings, then make sure the Mobile data switch is ON. Make sure that the Data enabled box is checked. According to the settings of your provider, you may need either to activate, or deactivate the data roaming option. Note that activating data roaming abroad causes an overbilling. Please consult the details of your mobile phone contract. Find more information in the following FAQ. According to the setup of your provider, check or uncheck the data roaming box of the corresponding SIM card. Go to the All Apps section and open Settings > SIM card management. If the solutions 1 & 2 do not allow you to have access to the 3G/4G networks, you will need to set up the access points. You can launch an automatic search or configure them manually. Select Network operators to start searching. Select your operator among the results. Refer to the setup given by your provider. You will also find some examples in the following FAQ. Select the access point of your provider to modify it or select the button to create a new one. Fill in the blanks according to the information provided by your mobile operator. Save the changes using the menu button (or the Menu button of your device). Make sure your access point is correctly checked so that you can use it. If, however, you encounter connection problems you will need to fill in the Access Point Name for your network provider. Fisrt, make sure your mobile data is activated on your device. Go to (or ) Settings. 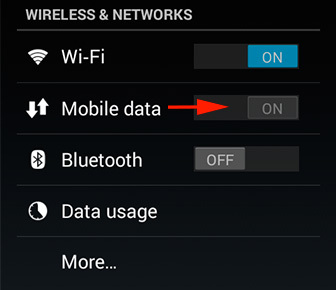 Depending on your device, a switch Mobiles Data may be displayed in the first section Wireless & networks, make sure it is in the ON position (in blue). If you don't see this option, press More... and then Mobile Networks / 3G Service and tick the box Data enabled. If your service provider uses a part of the network of another service provider (like Free Mobile) or if your are abroad, it's sometimes necessary to activate data roaming. 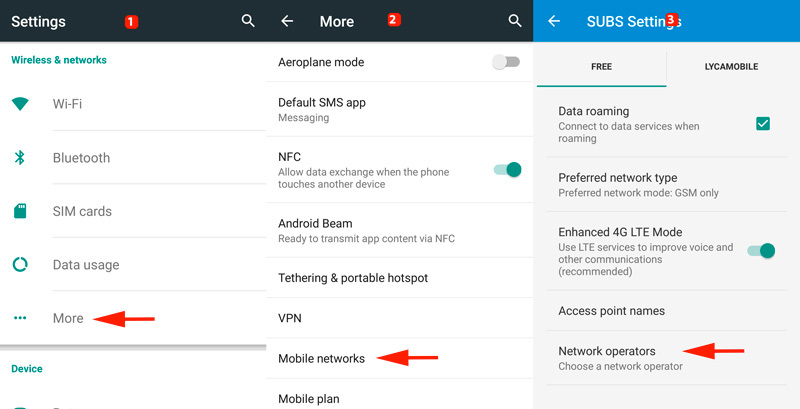 This option is available in (or ) Settings > More... > Mobiles networks / 3G Service. Please tick the box Data roaming once you checked with your service provider that this option should be activated. Please note that activating data romaing might increase your phone bill when travelling abroad. Contact your service provider for more information and deactivate this option if if it is not required to use your data plan. You can find more information in the following FAQ. In the menu Access Point Names, select the access point of your service provider that is already in the list or press the button to create a new one. You should input the information provided by your service provider exactly when filling in the different elements and save the modifications via the button (or the dedicated Menu of your device). You will find some examples of APN settings in the following FAQ.